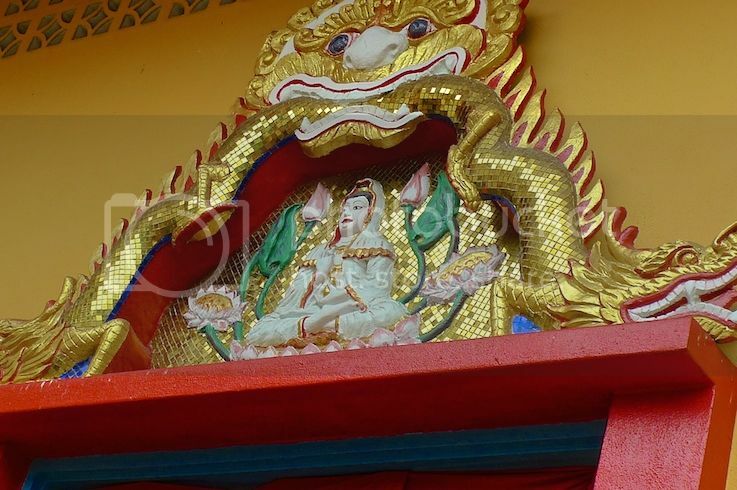 My fourth and final day in Penang was spent visiting temples, temples and more temples! 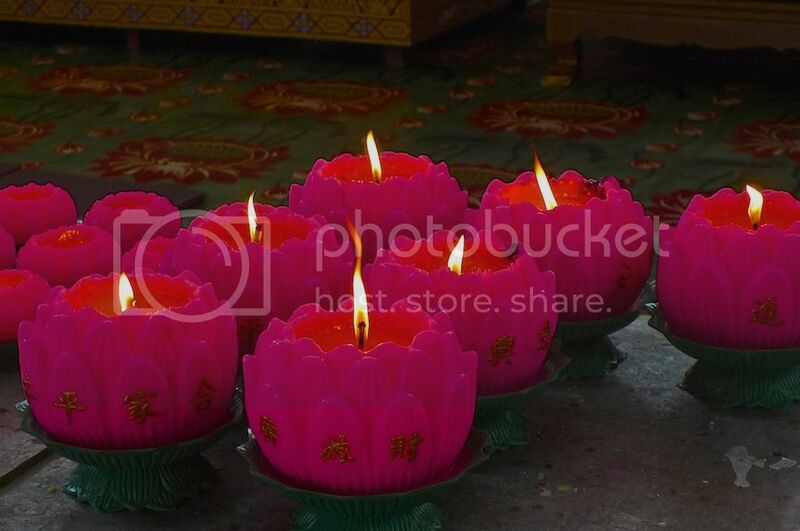 First I visited the Kek Lok Si Temple in Air Itam. 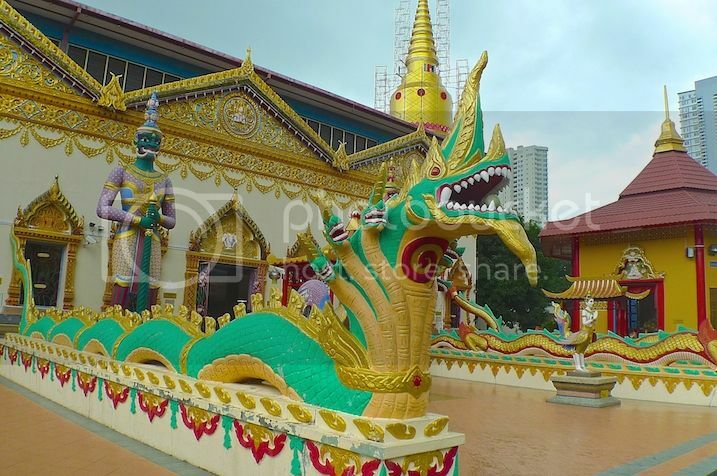 Then I visited the Dhammikarama Burmese Buddhist Temple at Burmah Lane (Lorong Burma). 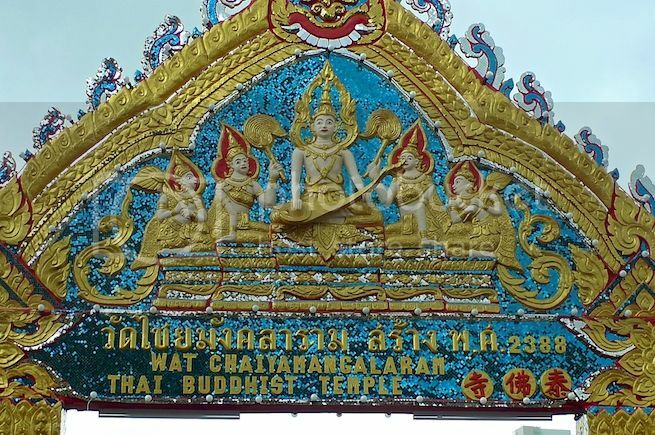 After that, I crossed the road to the Thai Buddhist Temple opposite where the famous Reclining Buddha resides. 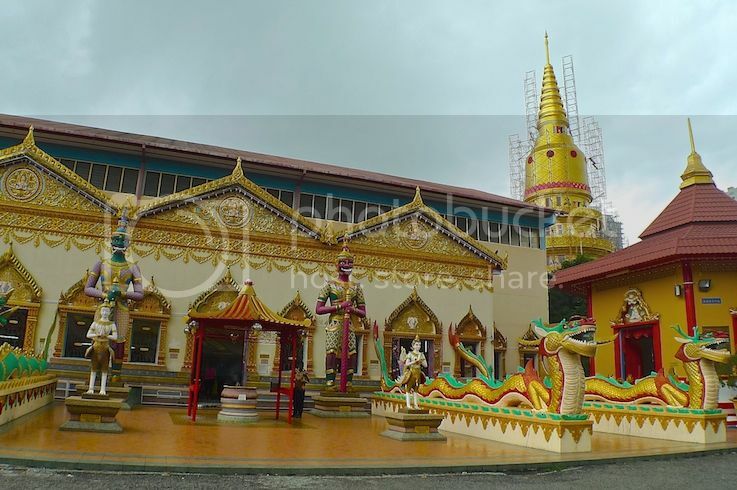 Known as Wat Chayamangkalaram (also written as Wat Chaiyamangalaram), this Thai Buddhist temple was built in 1845 by a Buddhist monk from Thailand. The story goes that this monk was very fond of Penang's laksa. 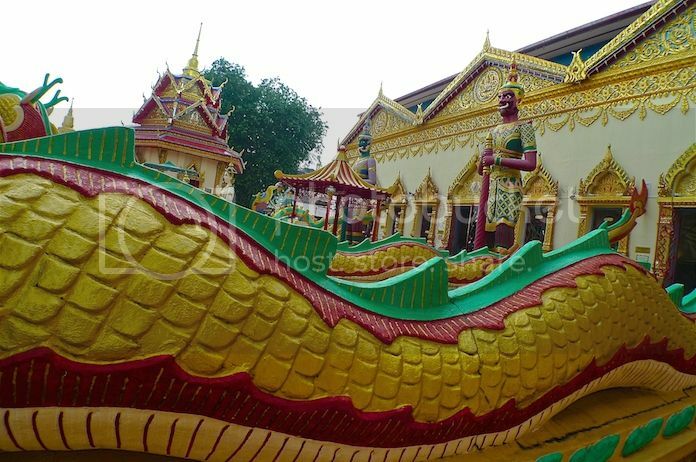 Even to this day, devotees bring a bowl of laksa as offering to his shrine. 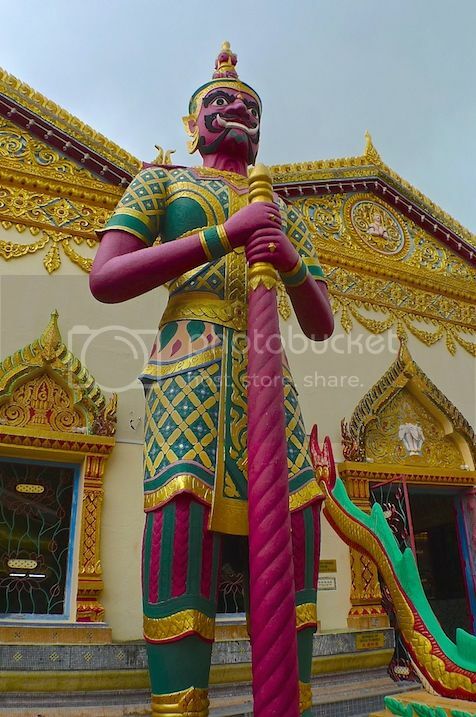 Walking towards the main temple building, I was greeted by two tall guardians. 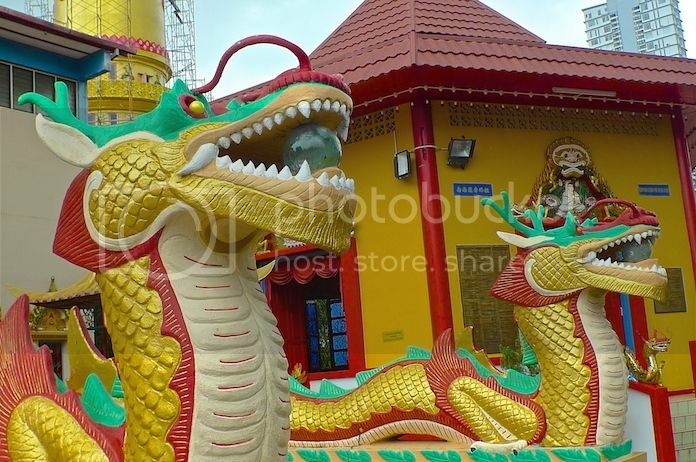 Next to the two guardians are a pair of seven-headed serpent on the left and and a pair of dragons on the right. 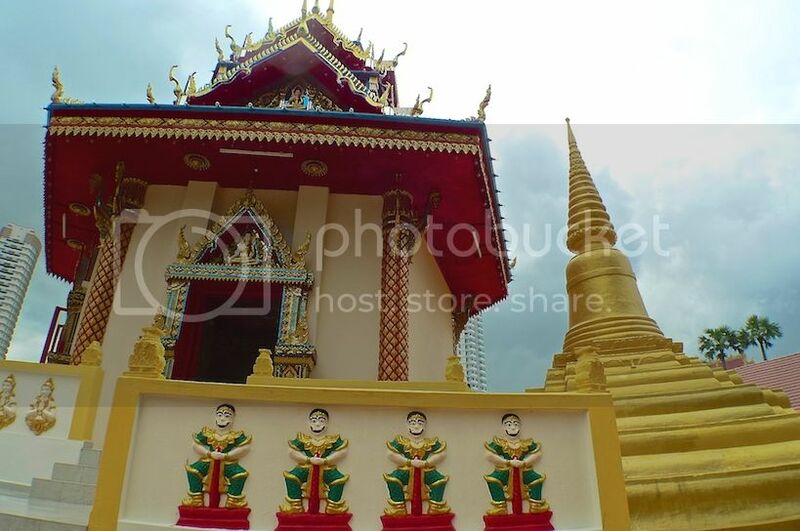 The temple was built on a 5-acre piece of land donated by Queen Victoria to the Thai community. 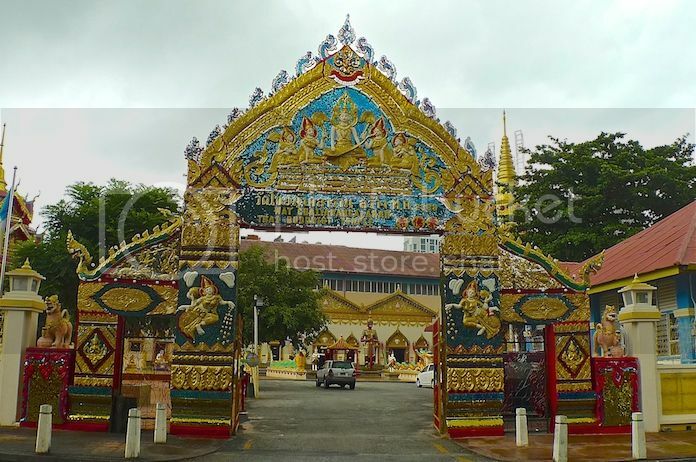 It is presently the largest Thai Buddhist temple in Penang. 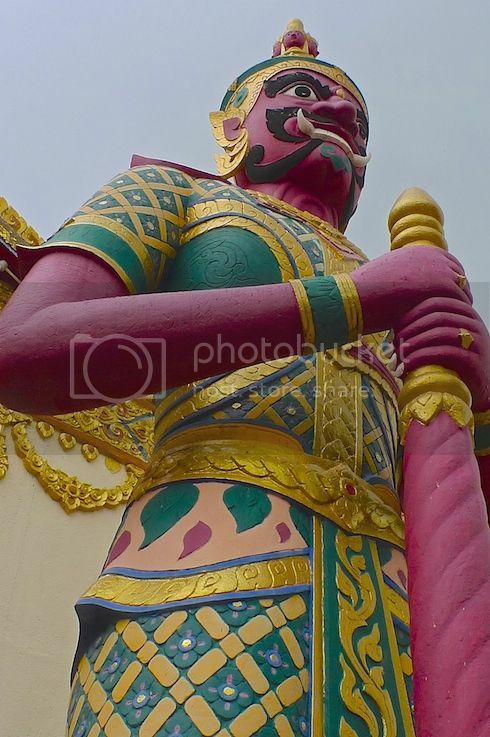 One of tall guardians guarding the temple. 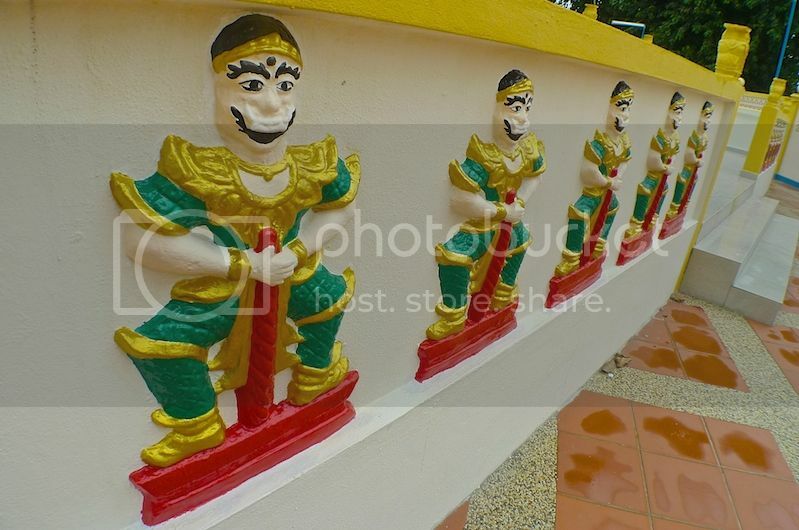 I have seen similar looking guardians at temples in Bangkok, Thailand. 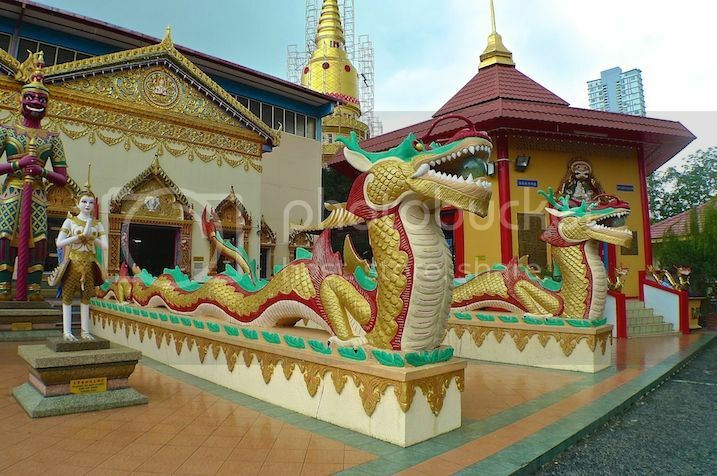 Inside the main temple is the magnificent 33-metre gold plated Reclining Buddha. Although it looks very huge, it is not among the largest in the world. 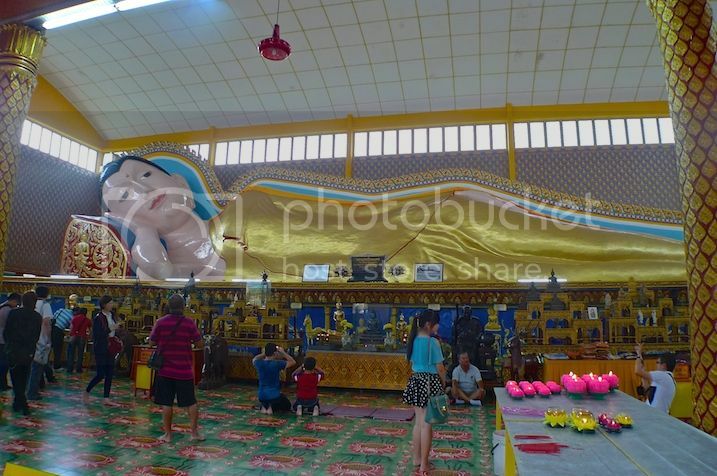 Even the Reclining Buddha at Wat Po in Bangkok is larger. 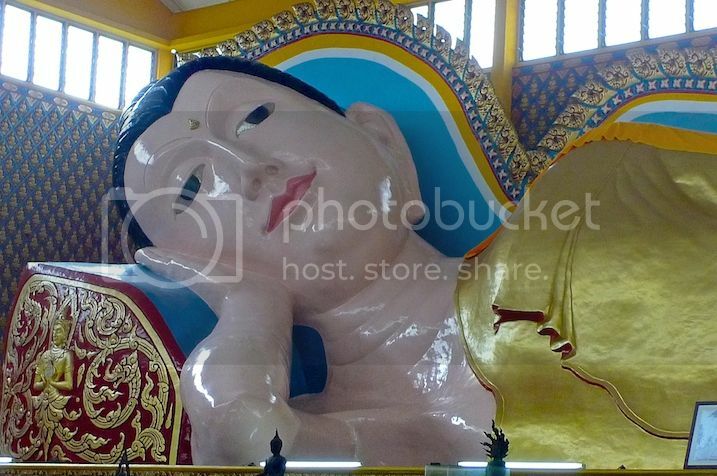 The Reclining Buddha actually represents the historical Buddha at his death. 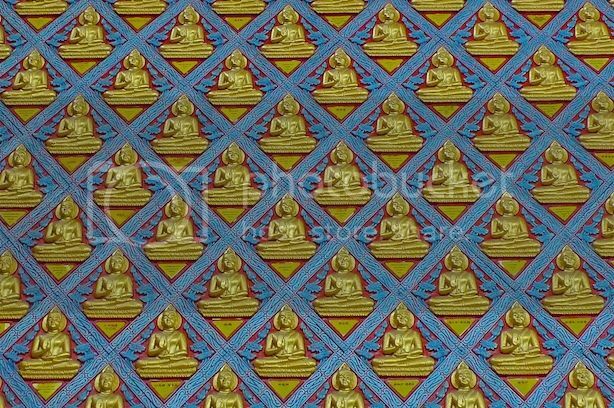 It is said that when Buddha knew his death was near, he laid there on the couch, reclining on his right side, with his head supported by his hand as he passed into nirvana. Notice the half smile on his face? It shows the serenity that comes with enlightenment. 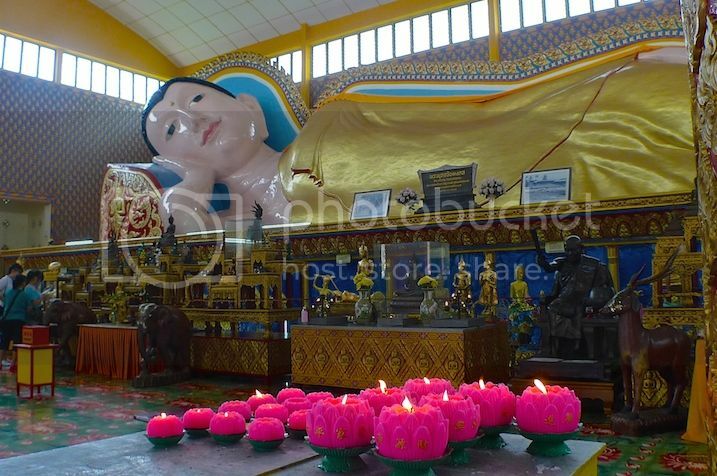 In fact, the whole reclining position of the Buddha with its peaceful demeanour serves to remind us that we have the potential to attain enlightenment and freedom from the sufferings of the cycle of rebirths. 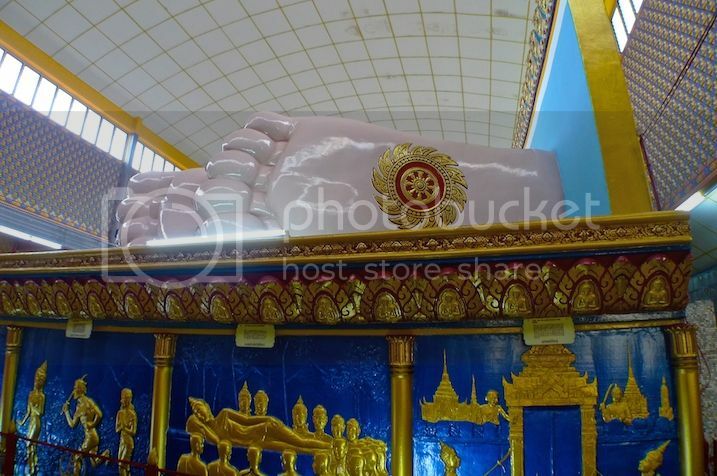 The Reclining Buddha was so long it was a little difficult to take a photo of the whole statue. 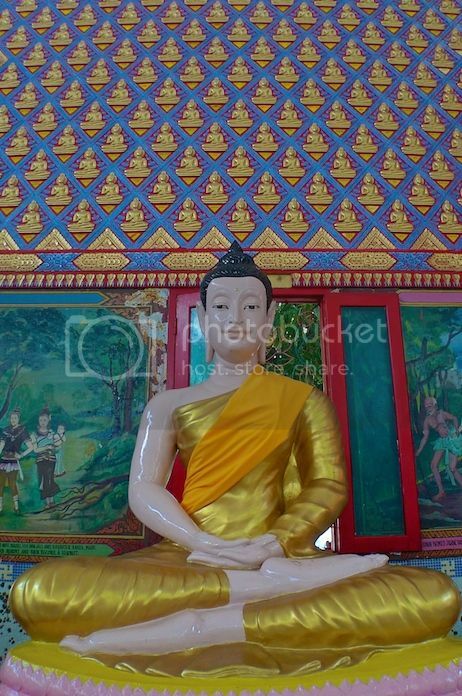 I walked round the Reclining Buddha and reached his feet. 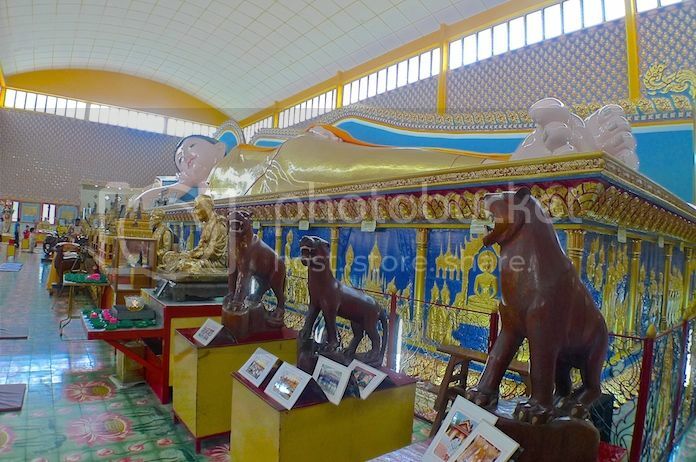 At the back side of the statue, I discovered that in fact, the Reclining Buddha is a columbarium housing niches containing ashes of the devotees. 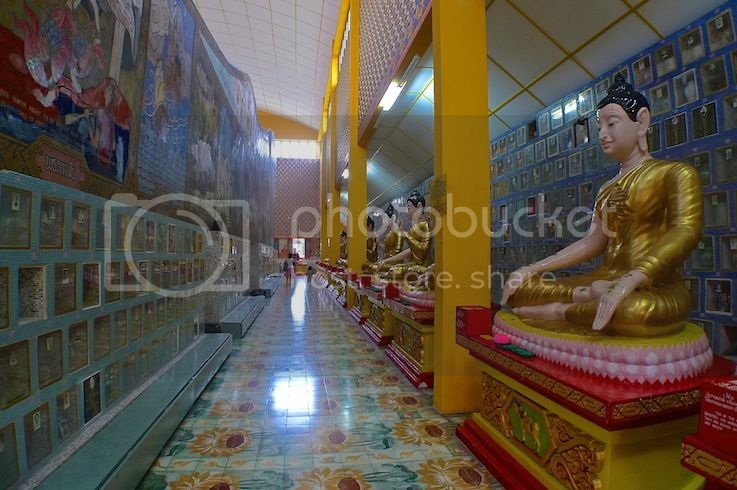 There were many Buddha statues in various postures at the columbarium. 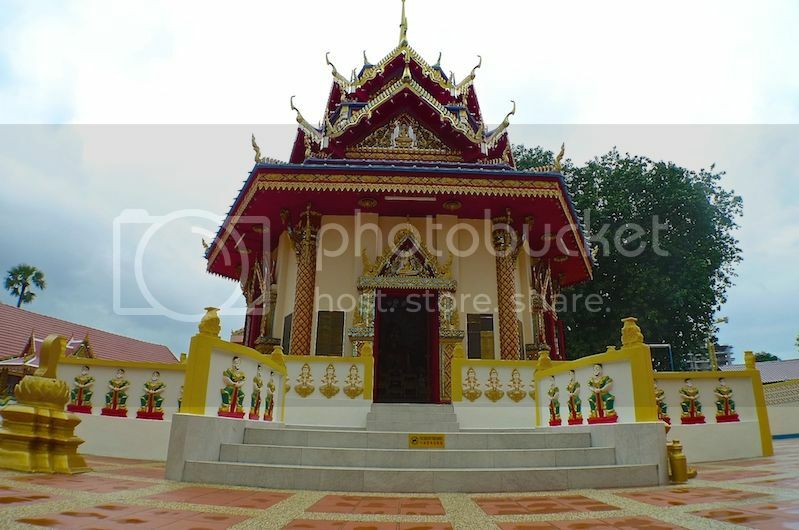 There is also a crematorium within the temple complex. Behind the temple is a small Thai village where the Thai community still lives and a Thai cemetery. 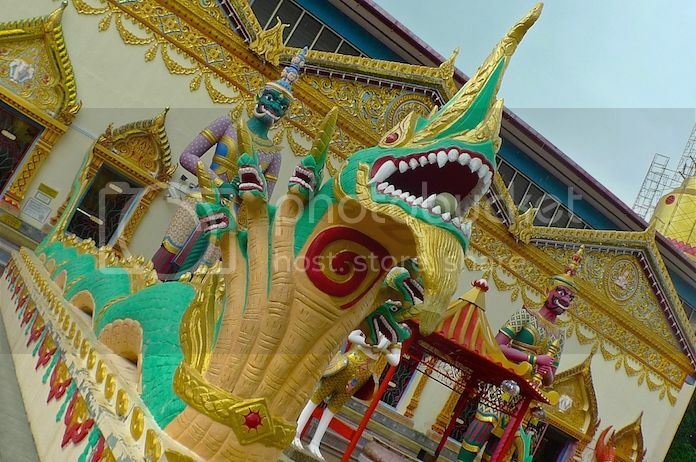 With the small Thai community there, Wat Chayamangkalaram is one of the few temples in Malaysia that stages Thai festivals like Loy Krathong and Songkhran. 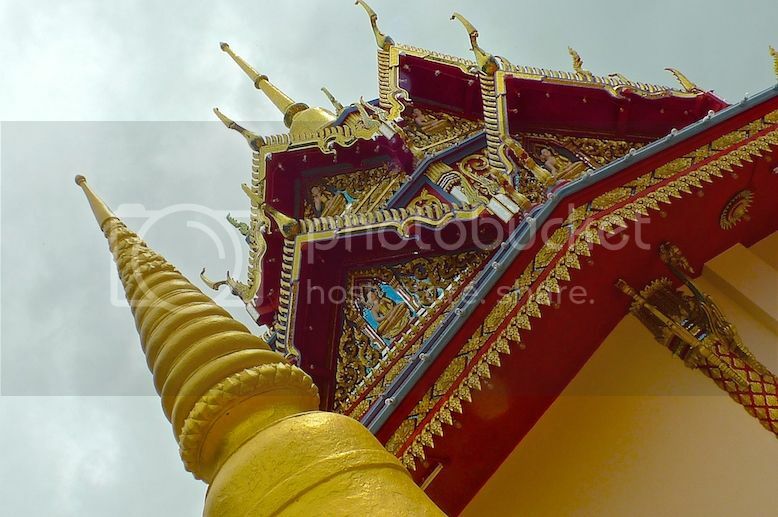 Having seen the Reclining Buddha, I stepped out of the temple again. 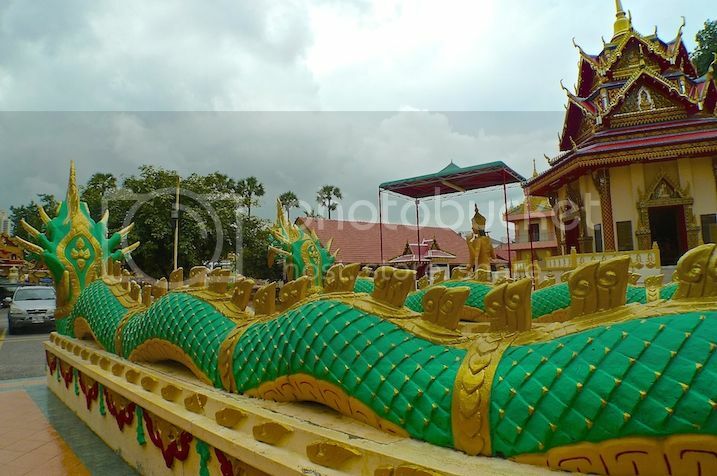 I took this photo of the seven-headed serpents from the back. 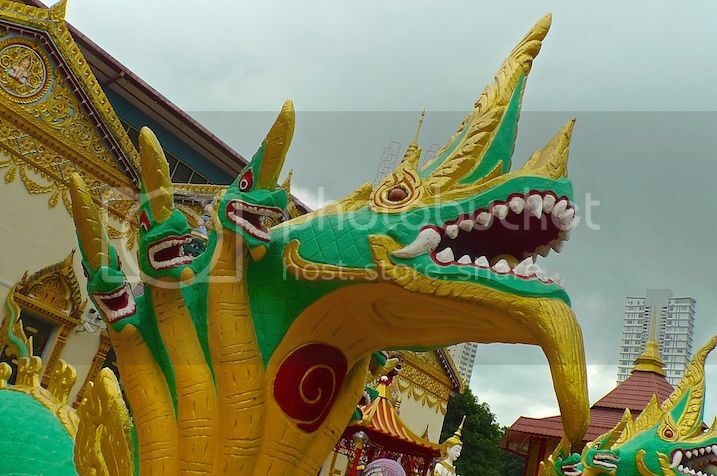 A shot of the seven-headed serpent up close. There is another building near the main temple building, although I am not sure what building this is. Anyway, I took some photos. 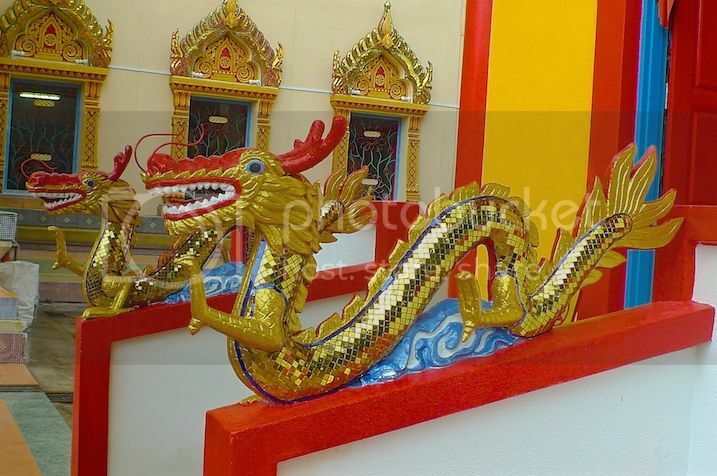 These 3D murals look quite interesting. 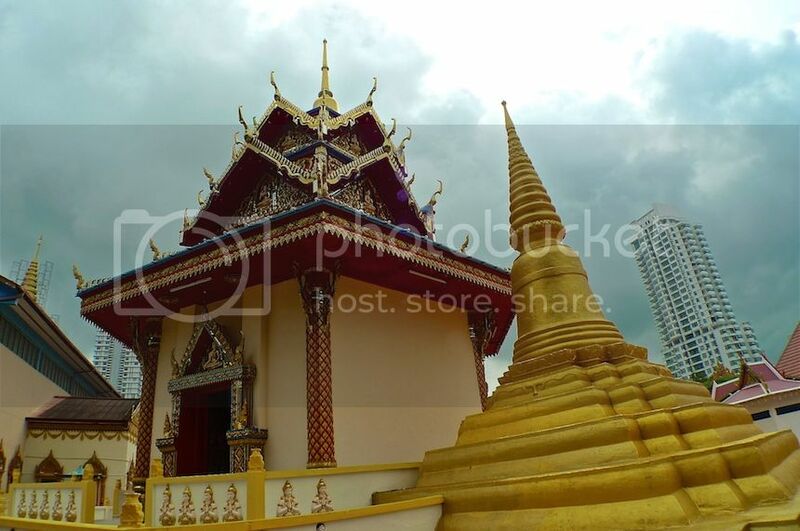 The building has a chedi (stupa) next to it. Oh look at the sky! I hoped it would not rain as I needed to walk back to my hotel and I did not bring any umbrella with me. 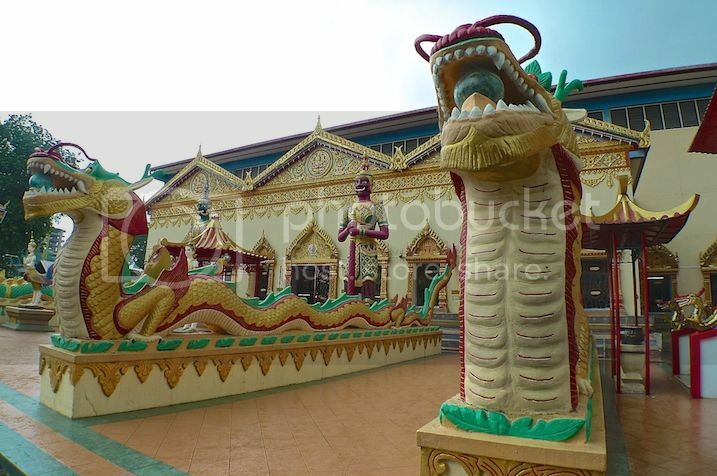 Yes, this temple and the Burmese Temple across the road are just within walking distance to Evergreen Laurel Hotel where I stayed. And then I remember... I have not eaten lunch yet!! So it's not time to go back to my hotel just yet. 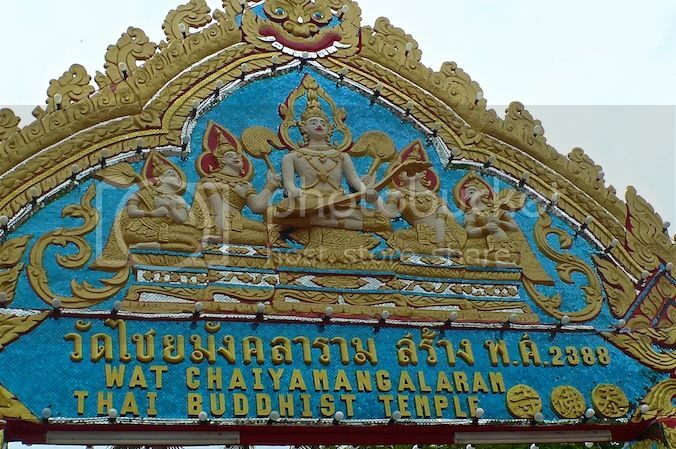 As I left Wat Chayamangkalaram, I said a silent prayer asking for the rain not to fall so soon. And I think I got my prayer answered. Thank you!